Gluten Free Strawberry Nutella Muffins | Clare Cooks! Posted on April 3, 2012 by Clare Cooks! 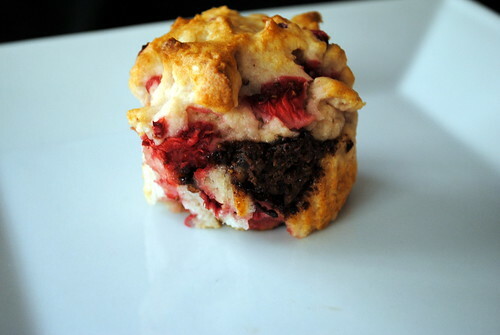 My first strawberry endeavor was this delicious muffin recipe. It’s perfect for a sweet breakfast treat and also makes a pretty satisfying dessert. Quite frankly, it’s pretty hard to go wrong with Nutella. The fresh strawberries only make the Nutella even more enjoyable. My favorite part of these muffins is the little Nutella line that runs through the center. It basically ensures you get a bit of Nutella in every bite! In a medium bowl, whisk together the flour, salt, baking powder, and sugar. In a separate bowl, whisk together canola oil, egg, buttermilk, and vanilla. Fill each muffin cup half way with batter. Next, add a small spoonful of Nutella to each muffin cup. Cover the Nutella filling with the remaining batter. Bake muffins for 22-26 minutes, or until muffins are golden brown and a toothpick comes out clean. Remove the muffins from the pan and let cool on a cooling rack. Yield: 12 muffins. 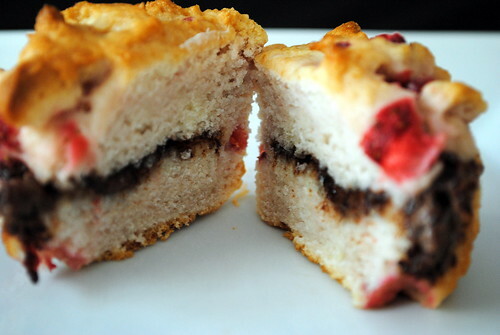 Love the idea of Nutella in the middle of this muffin. How much xanthan gum do I use if I’m not using better batter? I usually use 1/2 teaspoon of xanthan gum per cup of flour. I found this chart on the Bob’s Red Mill site, http://www.bobsredmill.com/recipes.php?recipe=888 it might be able to help you bit better.